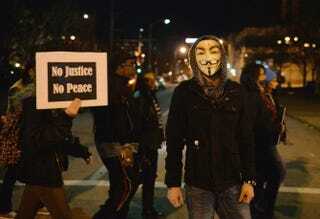 A protester wearing an Anonymous mask looks on as other people demonstrate during a silent protest in the streets of downtown St. Louis on March 14, 2015. The hacktivist group Anonymous has begun revealing the names of alleged Ku Klux Klan members, publishing their email addresses, Klan affiliation and phone numbers to Pastebin. Included in the list are nine politicians—four senators and five city mayors—but their association with the KKK is unverified. One mayor has denied any affiliation with the group. According to the International Business Times, the official Operation KKK Twitter account has acknowledged the list but has said that it "won't release names without due diligence." "We discourage the circulation of disinformation and will not promote an unverifiable list of politicians," it said in the now deleted tweet, according to IBT. Norfolk, Va., Mayor Paul Fraim, allegedly one of those named, has denied the claims in a series of tweets, calling it a "hoax" and "absolutely false." Last week the hacktivist group promised to unveil the names of 1,000 KKK members after accessing the information through a compromised Twitter account tied to the notorious hate group. As IBT notes, the KKK and Anonymous have been in a cyberbattle for some time, ever since the Ferguson, Mo., protests, when a local KKK chapter warned that it would use "lethal force" against anyone protesting in the streets. In response, the hacktivist group seized the KKK chapter's Twitter account and published some of its members' details. "After closely observing so many of you for so very long, we feel confident that applying transparency to your organizational cells is the right, just, appropriate and only course of action. You are abhorrent. Criminal. You are more than extremists. You are more than a hate group. You operate much more like terrorists and you should be recognized as such," Anonymous said in a blistering statement addressing the KKK, IBT notes.